Obverse: Peace standing on rock with sea in background, anchor behing, holding a branch in right hand and caressing a shield decorated with the portrait of Horatio Nelson, text around portrait EUROPE'S HOPE AND BRITAIN'S GLORY. Text around REAR-ADMIRAL LORD NELSON OF THE NILE. Reverse: The Britsh fleet at Aboukir Bay. Text around ALMIGHTY GOD HAS BLESSED HIS MAJESTY'S ARMS, text in exergue on two lines VICTORY OF THE NILE AUGUST 1.1798. Edge: Text FROM ALEXR DAVISON, ESQR ST JAMES'S SQUARE=A TRIBUTE OF REGARD. 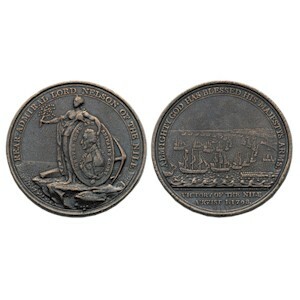 History: Nelson's victory at the mouth of the Nile on 1 August 1798 was celebrated in a novel manner by his prize agent, Alexander Davison, whose name and London address appear on the edge inscription of the medal designed by Kuchler. Admiral Nelson's medal was stolen in 1900 and is believed to have been melted down.